It is many years since concerts have been held in the wonderful acoustic of Geelong’s historic Art Gallery. After yesterday’s concert, concerts of fine music should once again be a regular occurrence. An elite group of string players from the Geelong Symphony Orchestra were joined by violinists Jamie Parker and Emily Frazer in Bach’s Concerto in D Minor for Two Violins. The two violins and ensemble reveled in the wonderful acoustic, as did the audience. Tom Healey, Musical Director of Vox Angelica, introduced the choir with the comment that the performance brought together three art forms – music, poetry and visual art. One could easily add architecture as a fourth element. The choir’s items were loosely on the theme of summer, beginning with a performance of Summer is a comin’ in, purported to be the oldest song still surviving with its original notation. This round was sung in twelve parts with two part bass ground and set the tone for the fine singing to follow. The Bluebird, by Charles Villiers Stanford gave the first sopranos the chance to shine in the soprano obligato. This was followed by Im Wald, a beautiful part song by Fanny Hensel (sister to Felix Mendelssohn). American composer Eric Whitacre has become know for his sympathetic setting of words in choral music. This Marriage is a setting of a Persian poem by Jalal al-Din Rumi). A silence (given extra impact at this performance by the lively acoustic) precedes the final line… ‘I am out of words to describe how spirit mingles in this marriage’. New Zealander Clare Maclean also showed herself an expert with word painting with a setting of Michael Leunig’s We Welcome Summer. The composer’s direction is for a ‘sustained and luminous’ singing. It was certainly so in this performance. Two final songs, Sunset by Australian Iain Grandage and Sure on this shining night, in a setting my American Morten Lauridsen, rounded off Vox Angelica’s offering. Grandage’s work evokes the sizzling heat of sunset after a hot day as it sinks into purple night. Sure on this shining night dies away to a calm wonder in the beauty of a starry night. 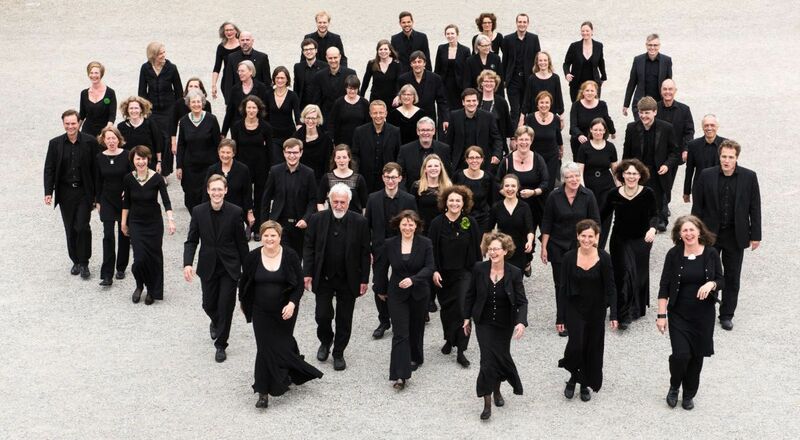 Vox Angelica has once again proved itself to be Geelong’s foremost chamber choir. Vocal technique is never an issue. Despite the lively acoustic, the diction for this performance was crystal clear, dynamics ranged for near silence to an unforced fortissimo and harmony impeccable. The concert concluded with Summer from The Four Seasons by Antonio Vivaldi, with Jamie Parker as soloist. I look forward to hearing these fine musicians in the Geelong Art Gallery again soon. The Geelong Symphony Orchestra’s 2019 season begins next Saturday (2nd March) at 7.30pm at Costa Hall, Deakin University. 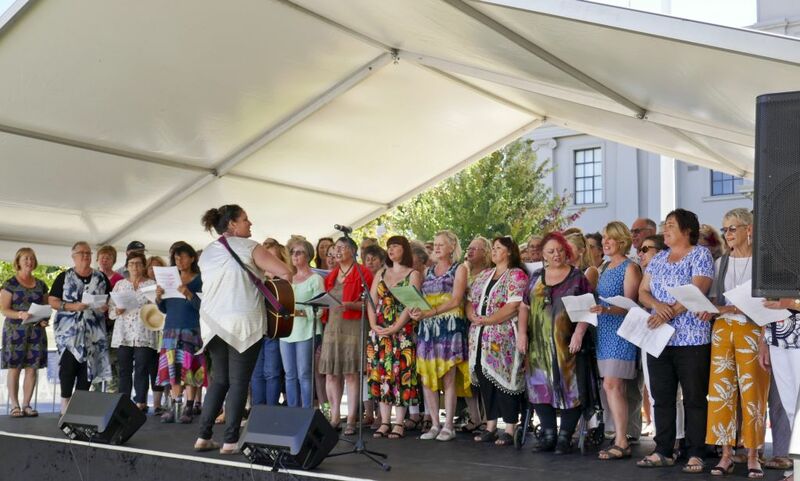 On the most perfect day for a festival, Acabellas were the only Choral Grapevine group to sing at the 2019 Pako Festa. Belinda McArdle, who leads Acabellas groups from around the region, led the group in a selection of her own original songs. Despite the open air stage, and with only a mike for Belinda’s guitar, the sound was amazingly good. The group sang with joy and the sound showed this, with clear three and four part harmony and clean unison singing. Singing with others is an uplifting experience. Acabellas are a perfect example of this. This performance marked the launch of Acabellas new recording Up in Lights. Today the light was sunshine and the light shining from the happy faces of these fine performers. As well as the title track, the audience were treated to a few other highlights from the CD including Breathe, I’ll Try and Big Love. You can purchase Up in Lights direct from members of Acabella or directly from Belinda. Windfire Choir conducted by Rick Prakhoff, Tim Reynolds – tenor, Fiona Squires -soprano, Ben Mitchell – narrator, Wendy Rechenberg – piano, Brighid Mantelli – flute, Philip Healey – violin, Chris Skepper – trumpet, John Seal – tympani, Frank De Rosso – organ. Presented by Music at the Basilica. Frank de Rosso – artistic director. Choristers from all over the Geelong region including Winchelsea and Melbourne amassed to create the Geelong Symphony Orchestra Chorus for the first ever performance in Geelong of Beethoven’s ultimate work The Ninth Symphony in D Minor, Op. 125. The soloists were Lee Abrahmsen – soprano, Belinda Patterson – alto, Brenton Spiteri – tenor, and Manfred Pohlenz – bass. This concert marked the GSO’s third anniversary. For a review of the concert by Colin Mockett, go to Entertainment Geelong. Choral Grapevine choirs represented in the GSO Chorus were Coryule Chorus, Windfire, The Geelong Chorale, St Mary’s Choir, Vox Angelica, Wondrous Merry, Geelong Grammar School Choir, Geelong U3A Choir, Geelong Harmony, Geelong College Community Choir, Geelong Sings, and Choir of St Paul’s, Geelong. At first it may seem a misnomer to title this divers program of choral music ‘romantic’. However, the romanticism of this concert lies in the sense that each work evokes its own atmosphere and each demands the listener to feel a strong emotional response. If that was the aim of this program, then it was supremely successful. A change of venue worked to the advantage of both choir and audience. St Paul’s Geelong has perfect acoustics for singers. Music at the Basilica was rewarded in this change by a good-sized audience, who clearly appreciated not only the acoustics but also the warmth and comfortable seating. The music ranged from Brahm’s substantial motet Warum is das licht gegeben dem mühseligen? to madrigals of love and loss by Monteverdi to works by Samuel Barber and Edward Elgar, modern Australian music by Anne Boyd, Alan Holley and Brenton Broadstock and concluded with Trois Chansons by Maurice Ravel. Joseph Rheinberger’s gentle Abenleid provided a most fitting encore. This ensemble goes far beyond technical expertise. Douglas Lawrence has melded the Australian Chamber Choir into a perfectly honed instrument of musical perfection. There is not a voice out of place. The depth of talent in the choir was demonstrated by the two finely matched quintets who performed two of the three Monteverdi madrigals Lasciatemi morire and Si, ch’io vorrei morire and the selection of soloists, including the impeccable singing of soprano Elspeth Bowden in Barber’s taxing Agnus Dei, and the quartet of fine soloists in Maurice Ravel’s Quatre Chansons. Of special note was the shimmering intensity of Anne Boyd’s As I crossed a bridge of dreams, composed in 1975. The final presentation of this program will be the Art Gallery of NSW on Sunday September 16th at 6.30pm. If you missed TRUE ROMANTICS, the Melbourne performance was recorded by ABC Classic FM and presented as part of Evenings on 3rd August. You can listen to this recording at http://www.abc.net.au/classic/evenings/australian-chamber-choir-true-romantics/9833258. 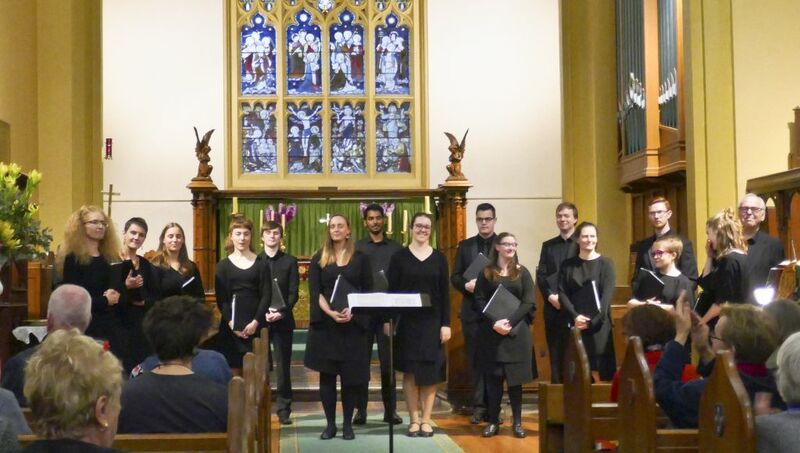 Geelong audiences will once again have the opportunity to hear the Australian Chamber Choir in their final program for 2018, A BAROQUE CHRISTMAS, to be presented on Sunday 2nd December at 3pm, at the Basilica of St Mary of the Angels.